Derek Alvarado originally attended Stanislaus State in the 1990s for his bachelor’s degree, and he recently came back to the University to receive his master’s in counselor education. His experiences as a graduate student and undergraduate student are night and day. When working toward his bachelor’s, Alvarado has fond memories of hours spent studying at the library or socially in the quad. This time around, balancing a professional life with a demanding school schedule was more work and less play. “In a program that requires its students to come to school two to three times per week for three to six hours each evening, there is not much time left over in the night to complete assignments and prepare for work the next morning,” he said. 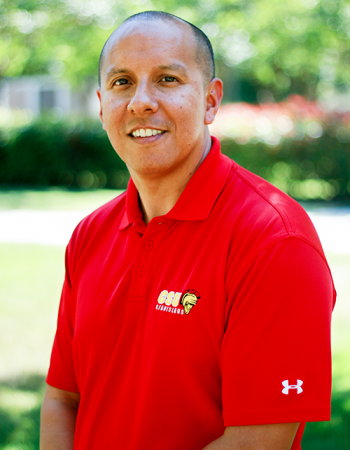 Despite the grueling schedule, Alvarado made the most of his graduate studies at Stan State. While some graduate students sit back and let their classmates do the talking, Alvarado takes an active role in the classroom. Upon graduation, Alvarado plans to put his degree to good use, advocating for students of all ages, ethnicities and those with physical and/or cognitive disabilities. “I plan to use my degrees and work and life experiences to help students further their academic, personal and career goals,” Derek said. “Two wonderful women in the financial aid and cashier departments had the greatest impact on my academic career as a graduate student. Mary Jane Cullum and Marilyn Alvarado both maintained communication with me regarding finances and registration deadlines that were helpful in ensuring a smooth and efficient academic plan. In fact, there wasn’t a time in which I missed an academic deadline or wasn’t updated on important semester information that related closely to my educational plan​."